I don’t remember the last time I misspelled a word so badly it got the better of a spellchecker. I mean really fooled it into not having the first clue what you’re on about. This is quite impressive. 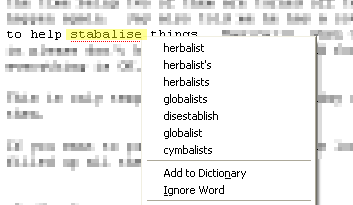 I was just one letter out on the British English spelling of "stabilise", and two letters away from the more computer-friendly "stabilize". The suggestions all contain a "b" and an "l", but otherwise they’re strong candidates for the worst random spelling guesswork in the world ever.